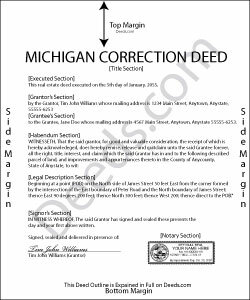 Use this correction deed to correct an error in a previously executed and recorded deed. Correction deeds are used to adjust the earlier deed when that document contains minor errors of omission or typographical errors, sometimes called scrivener's mistakes. For example, a misspelled name, an omitted or wrong middle initial, a minor error in the property description, or an omitted execution date. Do not us the correction deed for more substantial changes, such as the removal of a name from a deed. Such alterations are better handled through a quit claim deed. The correction deed, also called corrective deed, must state that its sole purpose is to correct a specific error, which is usually identified by type. For example: an error in the grantor's name, or an error in the grantor's marital status. It also must clearly reference the type of document it is correcting and state the execution and recording date of that prior document, as well as the number under which it was recorded, either referred to as instrument number or liber (book) and page number. In subsequent sections, the correction deed repeats the information that was in the prior deed with the exception of the false, ambiguous or omitted information that needs to be corrected. By restating all the information from the earlier deed, this new deed of correction will confirm the previously recorded deed, which remains on record as is. Warranty deeds require a tax stamp from the treasurer's office before recording. If the prior deed is a warranty deed and the legal description is being corrected, be sure to get a new tax stamp for the current instrument as well. In some counties, any deed that contains the word "warrant" must be checked by the treasurer's office first regardless of the type of correction. Gretchen D. said: Quick and easy process to get the documents, and helpful to see the example filled out. Reply from Staff: Thank you for your feedback Gretchen, we really appreciate it. Have a great day!